View More In Pot Racks - Page 10. From Franklin Brass, the 19.29" Steel Sheet Metal Rail with 6 Hooks is the perfect accessory for your kitchen, office or anywhere that you store keys or small items. Keep all of the family’s keys in one location. Try it in your bathroom or closet as a great way to organize your necklaces and other jewelry. 5 lb. Maximum weight capacity when mounted into solid Wood or Wood studs. 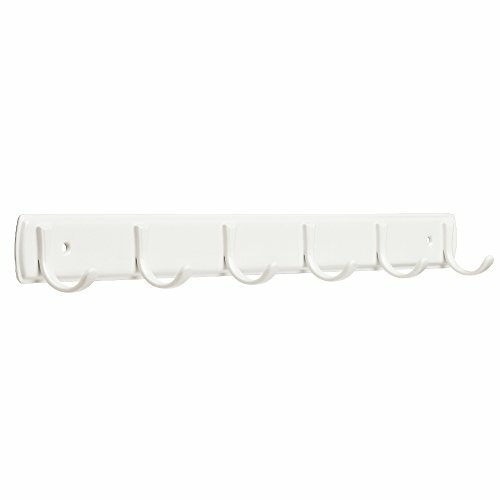 The White Finish adds a simplistic approach to home organization. Sturdy design, great storage solution small spaces. Neatly organize keys and other small items. Easy to install. Mounting hardware and installation instructions Included. Product constructed of steel sheet metal.